One thing I’d like to do more consistently on the blog is to share personal updates. This past year the blog has had many ups and downs and while I love talking about destinations and family travel, sometimes I want to get back to the old days of an online journal. In many ways, Instagram stories have become my outlet for sharing the everyday thoughts and family life. But, not everyone is on Instagram, and those stories are only live for 24 hours. The past 6 weeks have been a blur as we’ve visited, Louisville, Evansville, Cincinnati, and then finished up May with 10 days in Ireland. Through our “local travel,” I’m constantly amazed at how much the Midwest has to offer families! I’ll be sharing more about Evansville and Cincinnati in the coming weeks, but the main takeaway was that I didn’t have enough time in either (we spent 2 nights). Ireland was just IRELAND. It was magical. It was greener than I imagined, and more mountainous than I expected. The roads were narrow (think American bike path and add a car and a semi) and anxiety-producing. LOL. This was the first trip in a couple years where we didn’t face illness or bad weather. Instead, we packed all our rain gear and only wore our coats a few times as a windbreaker. Ireland rolled out the sunshine and we are oh, so thankful. 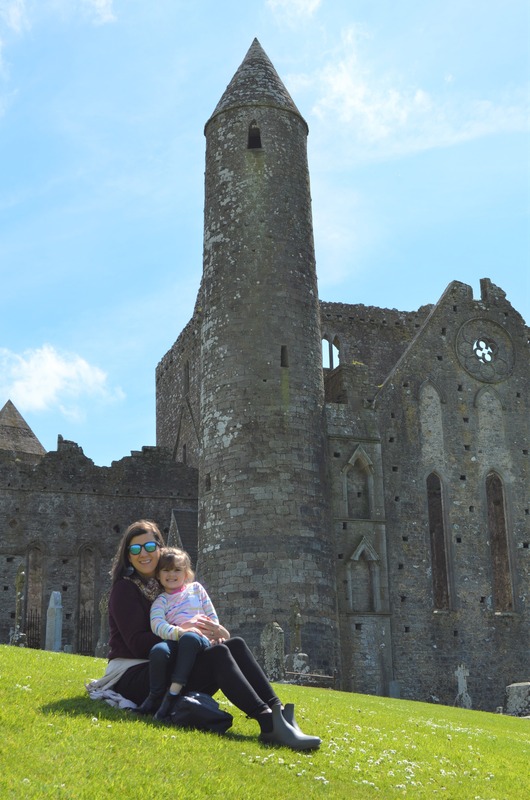 The Rock of Cashel and my girl. Look at that brilliant sky. While I said we didn’t face ILLNESS in Ireland, we were dealing with a broken bone. Jackson jumped off the bunk bed on Day 1 at our Louisville Airbnb (end of April) and BROKE HIS FOOT. The original diagnosis at the Louisville was that we were only dealing with a buckle fracture of 3 bones- NBD. Returning to our local pediatric orthopedic Dr., we learned that it was actually a more severe fracture of those 3 bones and then she found the 4th break. Thankfully, kids bones heal much better than adults and so we weren’t looking at surgery! The Dr. was nice enough to do a hard cast for those 2 weeks before we left and then switch over to the aircast for our overseas adventure. What’s even funnier about this (we can laugh now), is that I’d had my hand brace off for ONE DAY before Jackson broke his foot. I guess the clumsiness runs deep in our family. My hand is now fine, I’m cleared to lift weights again (starting light). My ring finger healed “short” (Dr. speak) which bothers me only when I drive. I’m not going to pursue surgery because there are worse things in life, right? All of this had led us to pursue changing our health insurance from traditional self-employment plan through United to a Christian healthcare service. Our insurance coverage is so minimal and the deductible is unbelievable. 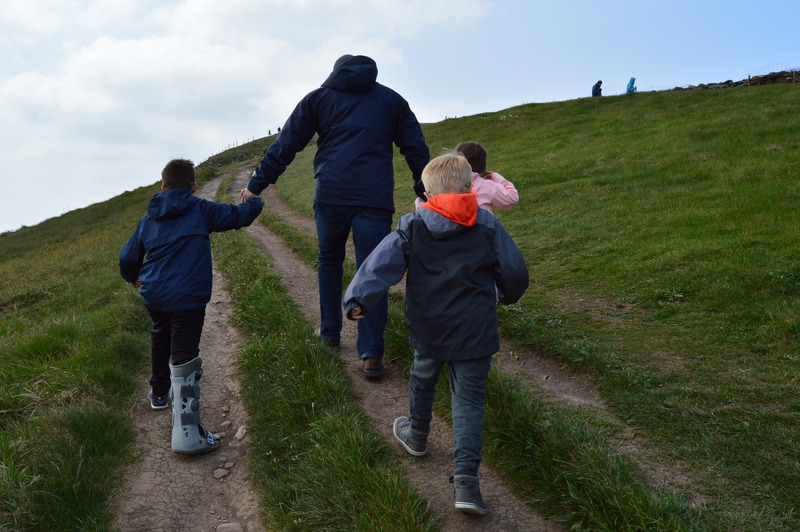 We didn’t let “the boot” keeps us from climbing major hills in Ireland. We finished our school year about a week before we left for Ireland. This year went so much better than I expected. We had a better routine going and I think what helped the most was having a designated homeschool room. No need to clear off breakfast and make room for books, just leave the room and come to the school room. Thinking more about it, I hate to say that we “finished up schooling” in time for Ireland. Ireland was educational. Travel is schooling. We shared many conversations about time zones, airports, countries, customs, music, scenery, etc etc etc. I will never apologize for taking our kids places in lieu of doing book work. At one point Cecilia said to the boys, “Do you know New York City is just across the river from New Jersey?” I couldn’t stop chuckling! She wouldn’t know that had we not flown into EWR and I see everyday how traveling is growing our children’s minds (end soapbox). June is busy with family time and local outings, but we’re only spending a couple of nights away! I think we’re all ready for some time at home. The kids are eager to catch up with friends that are now out of school, I’m eager to catch up on writing, and Mr. YT is eager to catch up on work! We are excited to be heading to Fort Wayne, IN for a couple of nights while we tag along for Brian’s work. What do you have planned for June? Any broken bones in your family? Any recommendations for Christian healthcare?